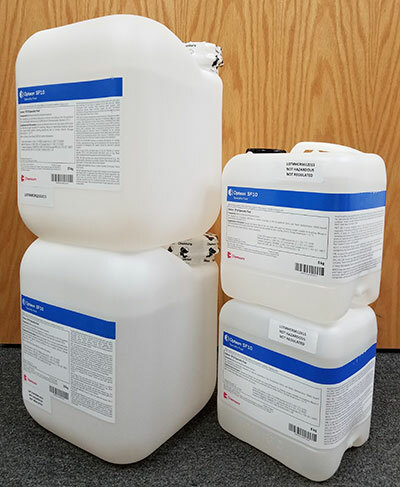 Chemours Opteon™ SF10 heat transfer fluid is a clear, colorless, non-flammable, thermally stable fluorinated fluid developed in response to worldwide market demand for a low environmental impact heat transfer fluid, brine coolant, dielectric fluid and test fluid. The fluid has a boiling point of 110 °C, broad operating temperature range(-90C to +105C), zero ozone depletion potential (ODP) and a Low global warming potential (GWP) of 2.5 (100 yr-ITH). Opteon™ SF10 is appropriate to replace PFCs, PFPEs, HFEs, HFCs and HCFCs in heat transfer applications. Opteon™ SF10 is a direct replacement for many Galden™ and Fluorinert™ fluids. The favorable characteristics of the product's viscosity and density enable superior heat transfer performance.